Out of Africa: Skinner Offers The Gordon Lankton Collection of African Art | Skinner Inc.
His extensive holdings of African art are the culmination of a wide-ranging collecting career that has included coins (American pennies with an example for every year back to 1794); World War II posters; cast-iron toy cars; and the largest private collection of Russian icons in the country. These are housed in their own museum in Clinton. “There is always something new out of Africa.” The Roman scholar Pliny the Elder made that comment in the first century A.D. and it remains true today. African art has been a source of fascination and inspiration for centuries, never more than during the 20th century, when modernist artists such as Picasso, Matisse, Gauguin and Modigliani took inspiration from African masks, sculpture and pottery. Lankton began collecting African art fairly recently. 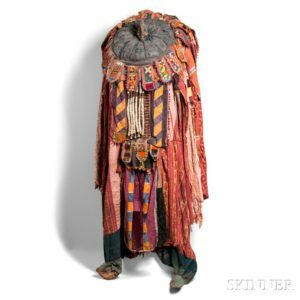 The core of his collection was 200 items purchased from a fellow collector of both icons and African material. 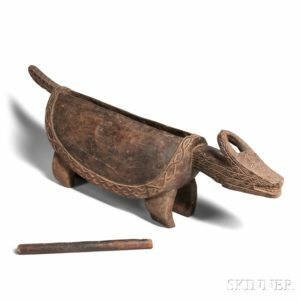 Over the years the Lankton collection of African objects has grown to over 600 pieces. His interest in ethnic art goes back to a long and long-ago journey. In 1956, recently discharged Army Lieutenant Lankton decided to take the long way home from his last posting in Germany. His nine-month motorcycle trip from Frankfurt to Tokyo covered nearly 20,000 miles and took him through twenty-three countries. The Middle East, India, and Indochina were not yet frequent tourist destinations for Americans. That journey through a post-World War II world gave the 25-year-old from Peoria, Illinois an abiding appreciation of ancient cultures with very different values and assumptions from those with which he was most familiar. The experience awakened in the young man a life-long fascination with the many ways in which non-European peoples experienced and interpreted the world around them. Lankton likes to assemble groups of objects that offer a complex and layered picture. He enjoys observing the subtle differences between objects that have a similar function, as seen for example in a number of West African divination urns, each serving the same ritual purpose but each possessing the individuality of its maker. 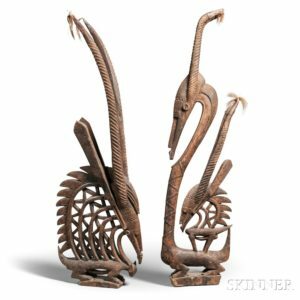 The Gordon Lankton Collection of African Art offers many pieces representing traditional skills of Africa that continue to this day. The collection had been displayed in Clinton for several years in an interactive gallery. Visitors were invited to enter into Lankton’s interest in workmanship and craft, his respect for other societies’ core values and spiritual practices, and his abiding curiosity about the human stories that objects can tell. The stories told in this collection have abiding interest as expressions of vibrant traditions, whether the mask, wood carving, tool, musical instrument or piece of pottery was made recently or many years ago. With their timeless decorative appeal, intriguing symbolism, and ingenious craftsmanship, the objects from the Lankton collection offer bidders the opportunity to acquire examples of craft and art that are timeless and universal. The online-only auction opens for bidding at 10AM on Thursday, June 15 to Friday, June 23 at 2PM. Auction previews are free and open to the public. They will take place at Skinner’s Marlborough Gallery on Tuesday, June 20 from 12PM to 5PM, Wednesday, June 21 from 10AM to 7PM, and Thursday, June 22 from 10AM to 5PM. This entry was posted in Blog and tagged african art, Clinton, Gordon Lankton, marlborough, massachusetts, Museum of Russian Icons, Nypro, skinner, skinner auctions, tribal art by Skinner. Bookmark the permalink. I was surprised to see that you had auctioned Lankton’s collection of African art, somehow I missed it. It was an impressive assemblage that I saw in Clinton some time ago. I am thinking about auctioning my collection of African art, started in the 1970’s, containing some very fine material. I am in Boston, location is convenient. I would think it would be a single-owner sale, with several hundred items, with concentrations on Ogoni, Ibibio, Guere, Bete, Yaka, Bassa, but also examples from other cultures. I love living with it but, frankly, my son will inherit it before all that long and it would be a burden to him. I have not photographed the collection methodically, but I do have some pictures. Some pieces have provenances, many don’t. Mostly purchased from specialist dealers in Belgium, France, Germany and America, some directly from Africa or local estates. Can you advise me how to proceed? And, does Skinner do well with type of material? Hello Michael, Thanks for the comment on the Gordon Lankton Collection! To find out what your collection may be worth at auction, I realize that it may be a challenge to submit each and every piece you have, but please submit what photos you do have and an auction evaluation form with a description of the collection on our website: secure.skinnerinc.com/appraisals/form.asp. The Appraisals Department can then determine how best to proceed for us to have the opportunity to view all of your pieces. They can coordinate with the appropriate Specialists as well as the Consignment Department for you. We will look forward to hearing from you!